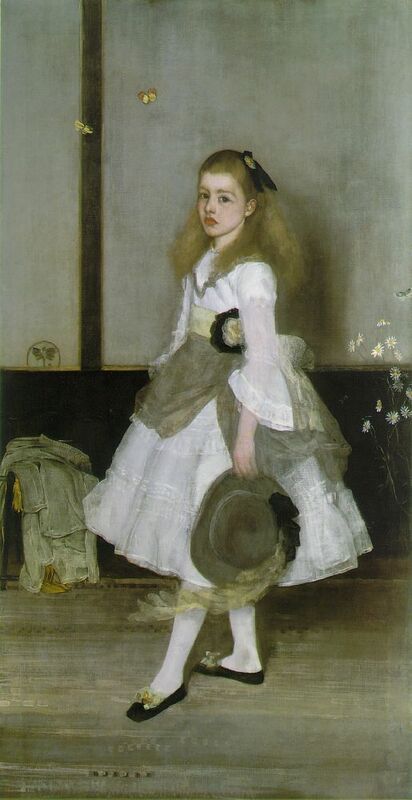 James Abbott McNeill Whistler was born in in 1834 in Lowell, Massachusetts, the third son of West Point graduate and civil engineer Major George Washington Whistler, and his second wife Anna Matilda McNeill. After brief stays in Stonington, Connecticut, and Springfield, Massachusetts, the Whistlers moved to St. Petersburg, Russia, where the Major served as an civil engineer for the construction of a railroad line to Moscow. James Abbott was aged nine when his family moved to Russia, and he spent several of his childhood years there, studying drawing at the Imperial Academy of Science. He soon became an inveterate traveller. In 1848 he went to live with his sister and her husband in London, and after his father's death the following year the family returned to the United States and settled in Pomfret, Connecticut. Whistler enrolled in the United States Military Academy at West Point in 1851, where he excelled in Robert W. Weir's drawing class. 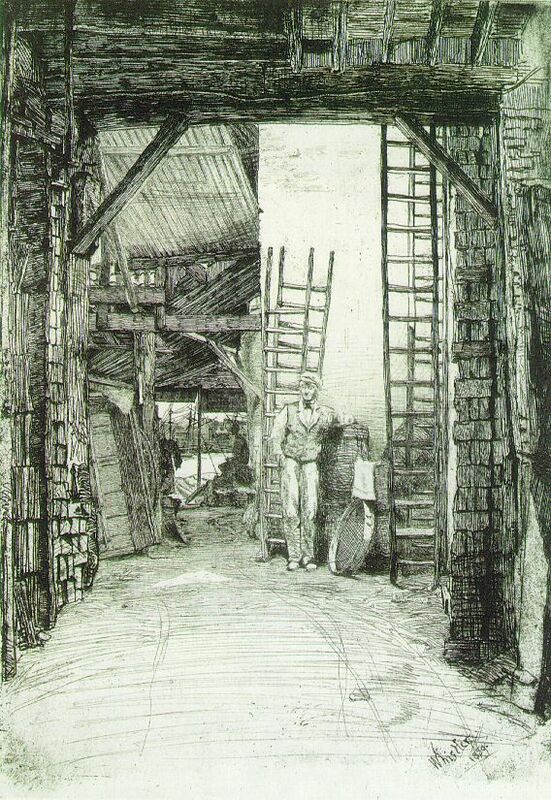 He was dismissed from the academy in 1854 for "deficiency in chemistry", and after brief periods working for the Winans Locomotive Works in Baltimore, and the drawings division of the United States Coast and Geodetic Survey (he learnt etching as a US navy cartographer), resolved to become an artist and moved to Europe permanently in 1855. Whistler settled in Paris first, where he studied at the Ecole Impériale et Spéciale de Dessin, before entering the Académie Gleyre. 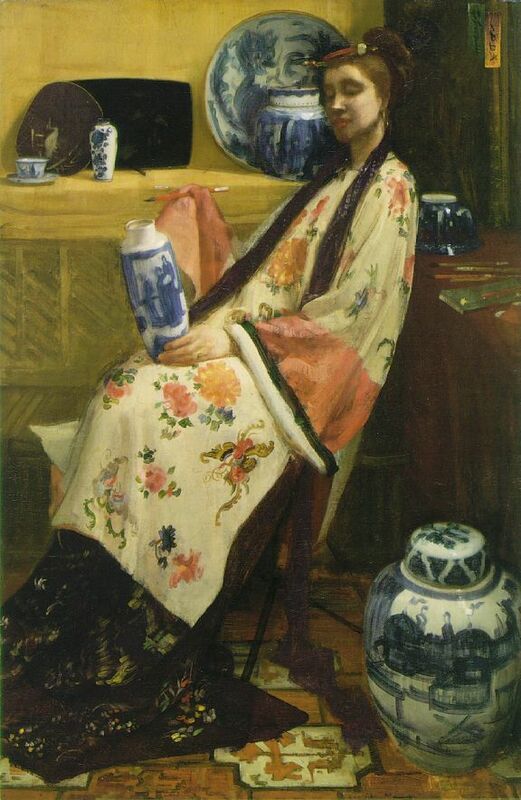 He made copies in the Louvre, acquired a lasting admiration for Velázquez, and became a devotee of the cult of the Japanese print and oriental art and decoration in general. Through his friend Fantin-Latour he met Courbet, whose Realism inspired much of his early work. The circles in which he moved can be gauged from Fantin-Latour's Homage to Delacroix , in which Whistler is portrayed alongside Baudelaire, Manet, and others. He quickly associated himself with avant garde artists, and was influenced by Courbet's realism, as well as the seventeenth century Dutch and Spanish schools. With Henri Fantin-Latour and Alphonse Legros, he founded the Société des Trois. After Whistler's At The Piano (Taft Museum, Cincinnati) was rejected at the Salon of 1859 he moved to London, but often returned to France. 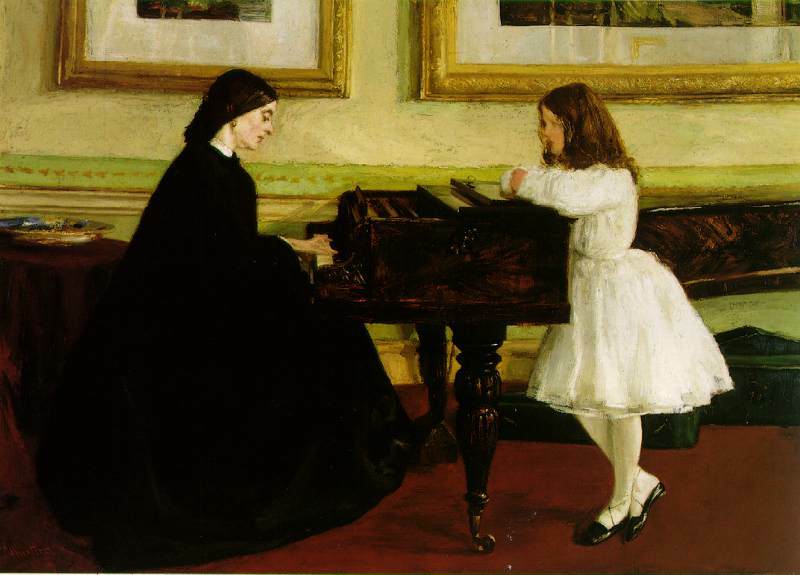 At the Piano was well received at the Royal Academy exhibition in 1860 and he soon made a name for himself, not just because of his talent, but also on account of his flamboyant personality. He was famous for his wit and dandyism, and loved controversy. His life-style was lavish and he was often in debt. He began work on a series of etchings. 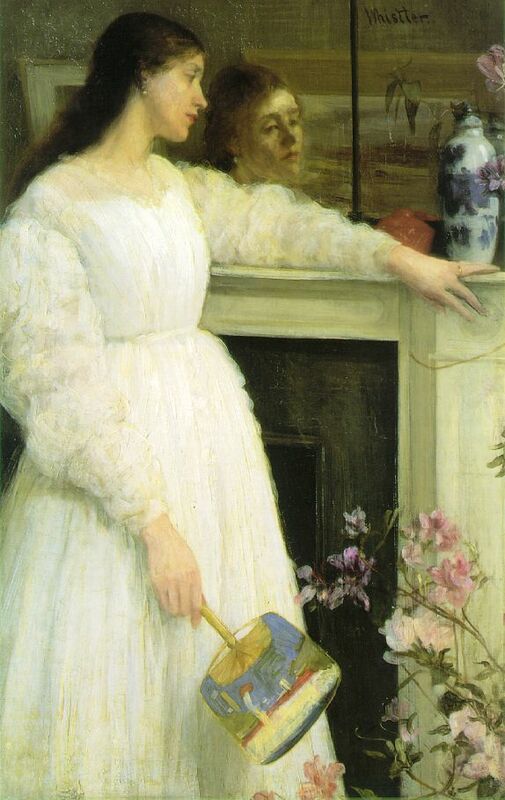 There Whistler was influenced by the Pre-Raphaelites, and he befriended Dante Gabriel Rossetti. Oscar Wilde was also among his famous friends. Whistler greatly admired Dutch masters such as Jan Steen, Rembrandt and Ruysdael. In 1858 he visited Holland to view the Nightwatch. Indeed, he became a frequent traveller to the Netherlands, visiting The Hague, Dordrecht and Domburg and producing numerous etchings of one of his favorite cities: Amsterdam. He achieved international notoriety when Symphony No. 1, The White Girl was rejected at both the Royal Academy and the Salon, but was a major attraction at the famous Salon des Refusés in 1863. Thereafter Courbet's influence waned, and Orientalism--and to a lesser extent classicism--became increasingly pronounced elements in his work. 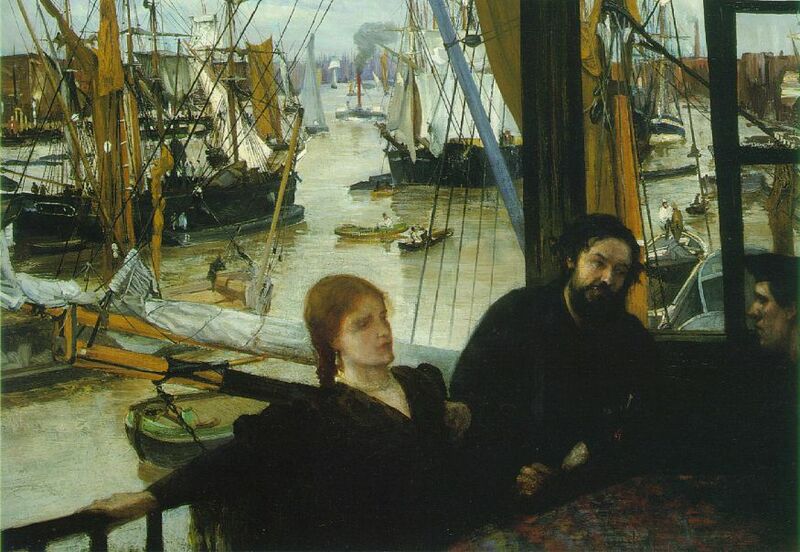 Whistler maintained close ties with France during the London years, and painted at Trouville with Courbet, Daubigny, and Monet in 1865. In 1866 he went to South America, where he painted seascapes in Valparaiso, Chile. After returning to Europe he commenced work on a series of monumental figure compositions for called the Six Projects (Freer Gallery of Art, Washington, D.C.), that reflect the influence of the English artist Albert Moore. 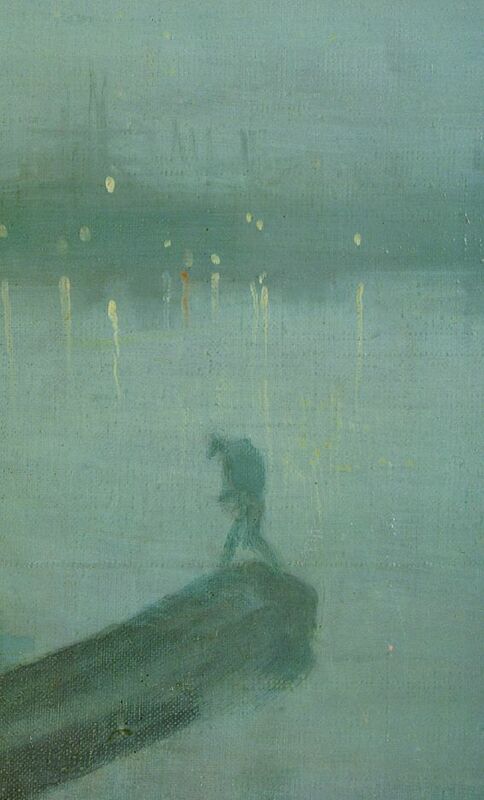 In 1869 Whistler began to sign his paintings with a butterfly monogram composed of his initials. In 1872 he painted his well-known Arrangement in Grey and Black, No. 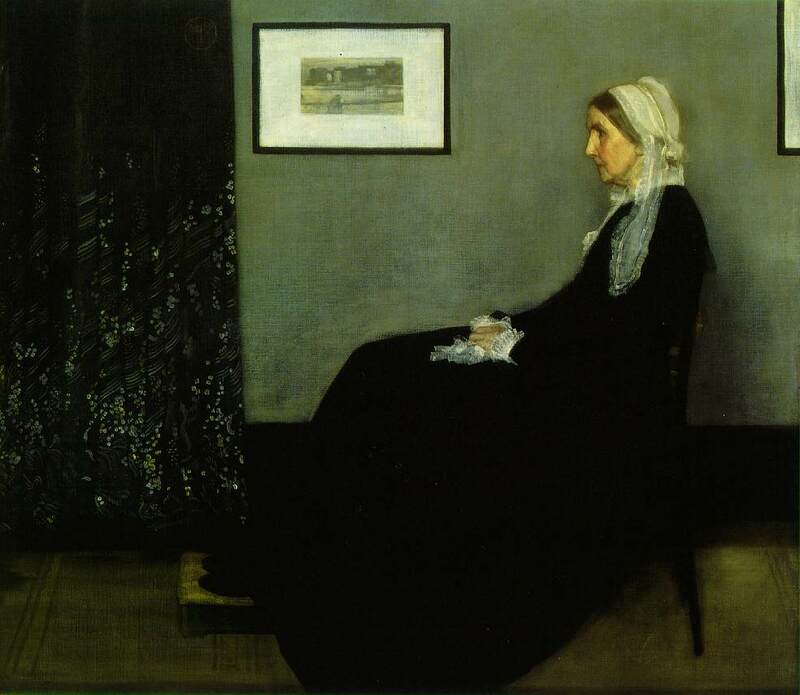 1: Portrait of the Artist's Mother , that was later acquired by the French government. 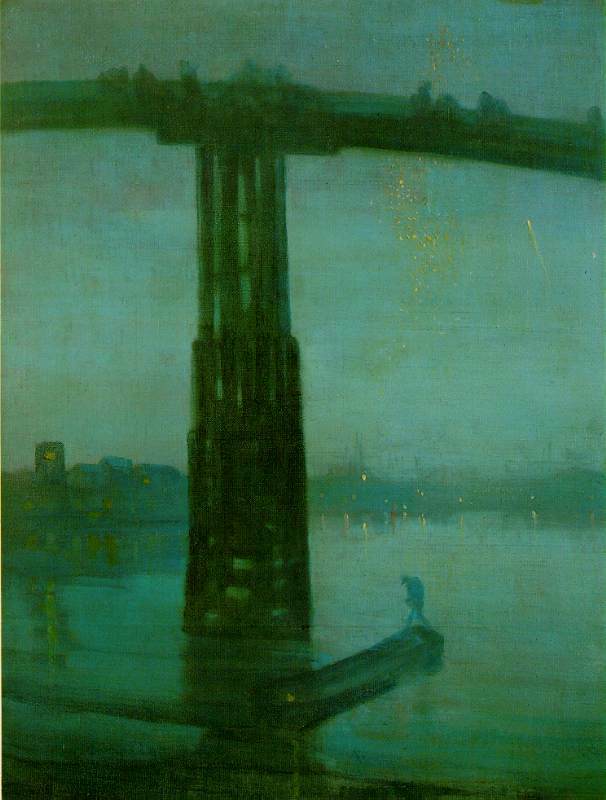 During the early 1870s he painted his famous "Nocturne" series, views of the Thames. 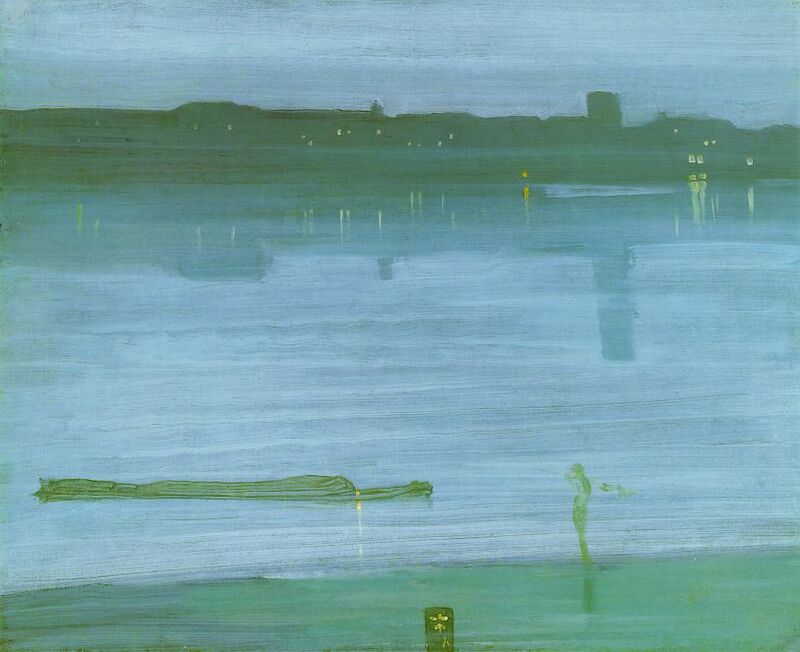 Whistler's art is in many respects the opposite to his often aggressive personality, being discreet and subtle, but the creed that lay behind it was radical. He believed that painting should exist for its own sake, not to convey literary or moral ideas, and he often gave his pictures musical titles to suggest an analogy with the abstract art of music: `Art should be independent of all claptrap-- should stand alone, and appeal to the artistic sense of eye or ear, without confounding this with emotions entirely foreign to it, as devotion, pity, love, patriotism, and the like. All these have no kind of concern with it, and that is why I insist on calling my works "arrangements" and "harmonies".' 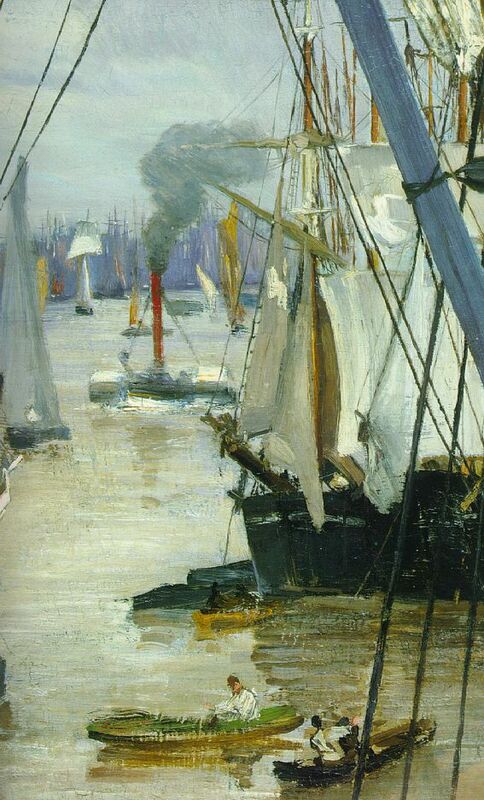 He was a laborious and self-critical worker, but this is belied by the flawless harmonies of tone and color he created in his paintings, which are mainly portraits and landscapes, particularly scenes of the Thames. 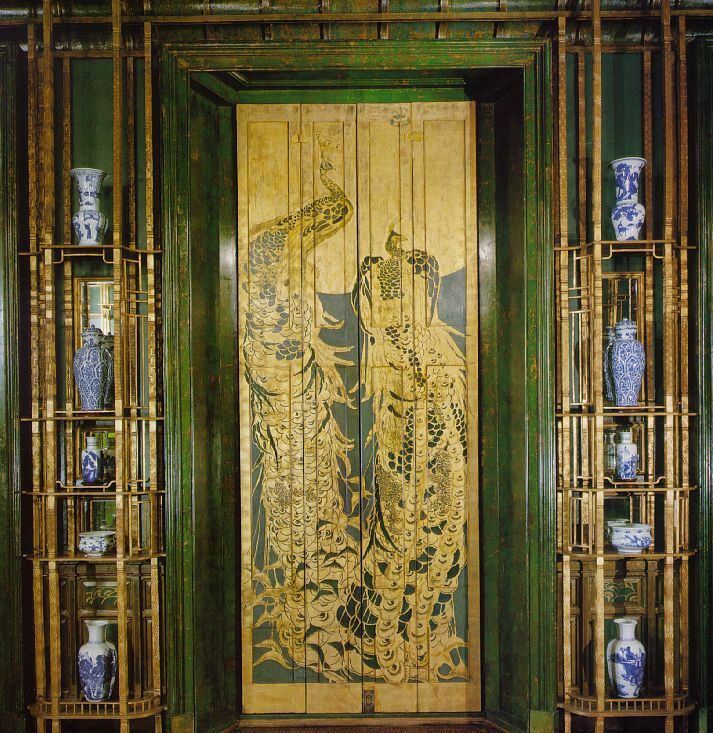 No less original was his work as a decorative artist, notably in the Peacock Room (1876-77) for the London home of the Liverpool shipping magnate Frederick Leyland (now reconstructed in the Freer Gallery, Washington), where attenuated decorative patterning anticipated much in the Art Nouveau style of the 1890s. Whistler's Peacock Room , or Harmony in Blue and Gold (1876-1877, Freer Gallery of Art), done for Leyland, exerted a strong influence on the Aesthetic movement's interior design. 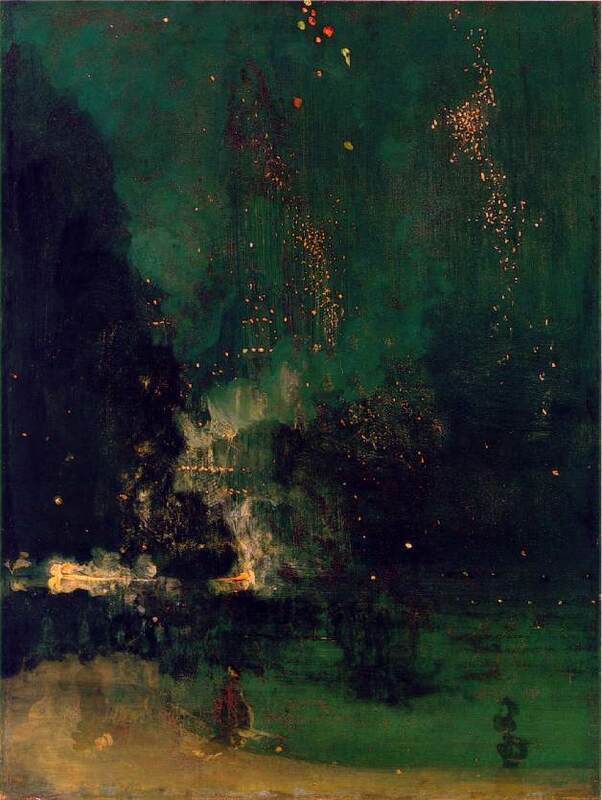 In 1877 the critic John Ruskin denounced Whistler's Nocturne in Black and Gold: The Falling Rocket (1875; Detroit Institute of Arts), accusing him of "flinging a pot of paint in the public's face", and Whistler sued him for libel the following year. He won the action, but the awarding of only a farthing's damages with no costs was in effect a justification for Ruskin. 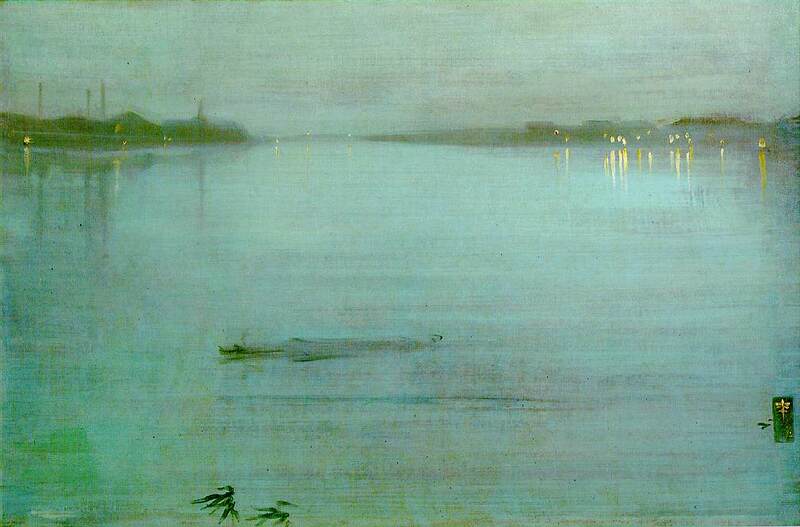 Potential patrons were repelled by the negative publicity surrounding the case, and the expense of the trial led to Whistler's bankruptcy in 1879. His house was sold and he proceeded to Italy with a commission from the Fine Arts Society to make twelve etchings of Venice. He spent a year in Venice (1879-80), concentrating on the etchings-- among the masterpieces of 19th-century graphic art-- that helped to restore his fortunes when he returned to London. After returning to England in 1880 he painted a wide variety of subjects, continued with his interest in the graphic arts, and promulgated his aesthetic theories in print and in the Ten O'Clock lecture (1885); his polemical The Gentle Art of Making Enemies was published in 1890. In 1886 he was elected president of the Society of British Artists, but despite some successes his revolutionary ideas ran afoul of the conservative members, and he was voted out of office within two years. 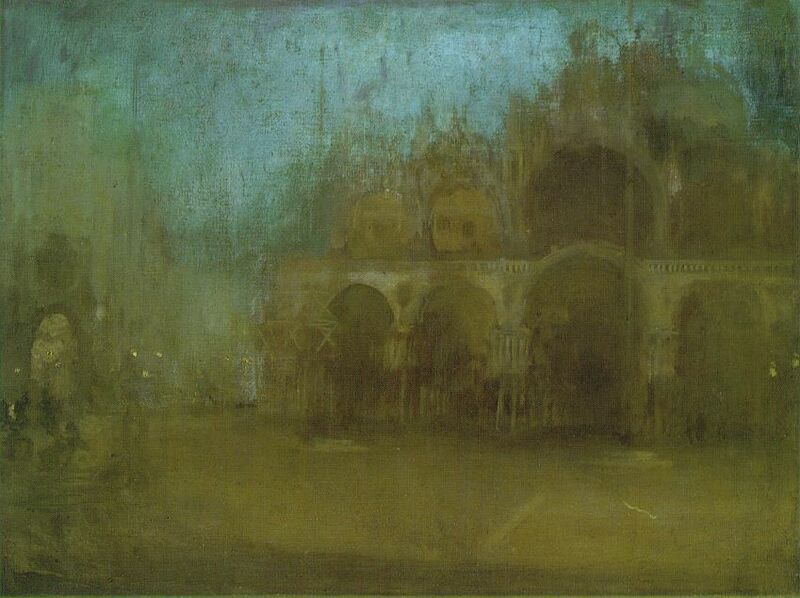 During the late 1880s and 1890s Whistler achieved recognition as an artist of international stature. His paintings were acquired by public collections, he received awards at exhibitions, and he was elected to such prestigious professional associations as the Royal Academy of Fine Arts, Munich. 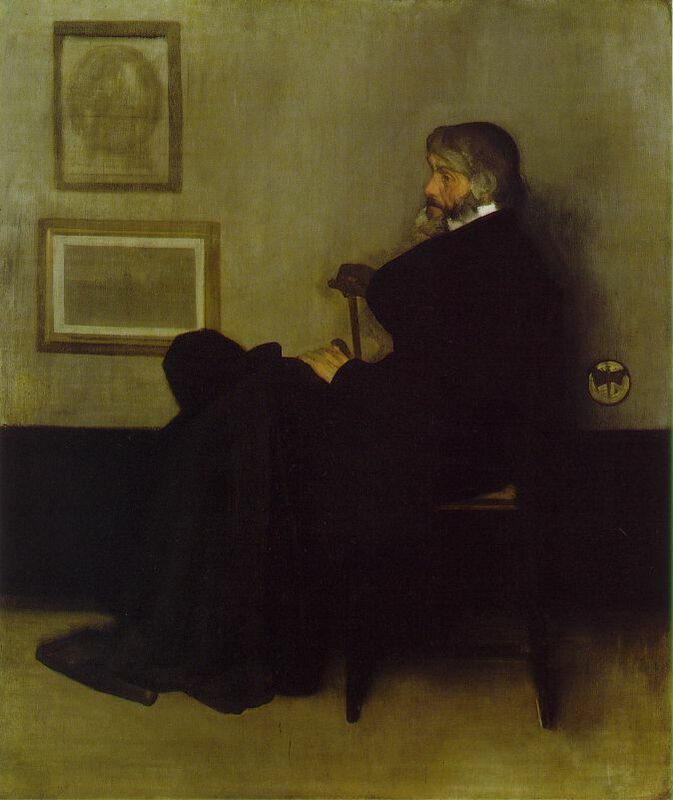 His portrait of Thomas Carlyle was bought by the Corporation of Glasgow in 1891 for 1,000 guineas and soon afterwards his most famous work, Arrangement in Grey and Black: Portrait of the Painter's Mother (1871), was bought by the French state (it is now in the Musée d'Orsay, Paris) and he was made a member of the Légion d'Honneur. In 1898 he was elected president of the International Society of Sculptors, Painters and Gravers. He made a happy marriage in 1888 to Beatrix Godwin, widow of the architect E.W. 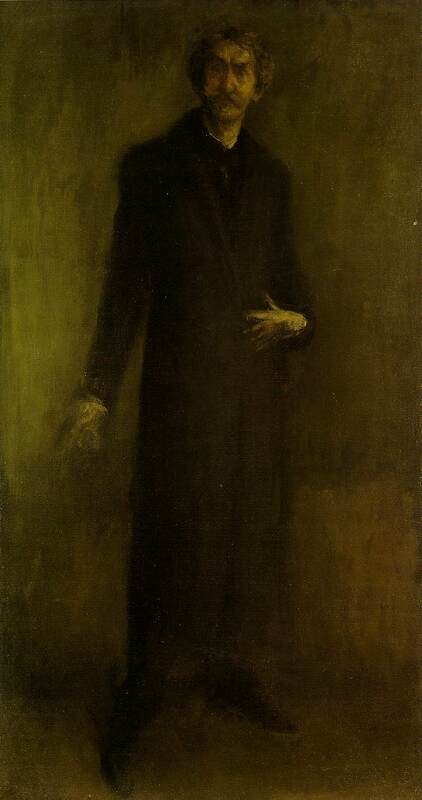 Godwin, with whom Whistler had collaborated, but she died only eight years later. He withdrew from an active social life around the time his wife Beatrice Godwin died of cancer in 1896. In 1903, the year of his death, a memorial exhibition was held in Boston; the following year similar retrospectives were held by the International Society in London, and the Ecole des Beaux-Arts in Paris. 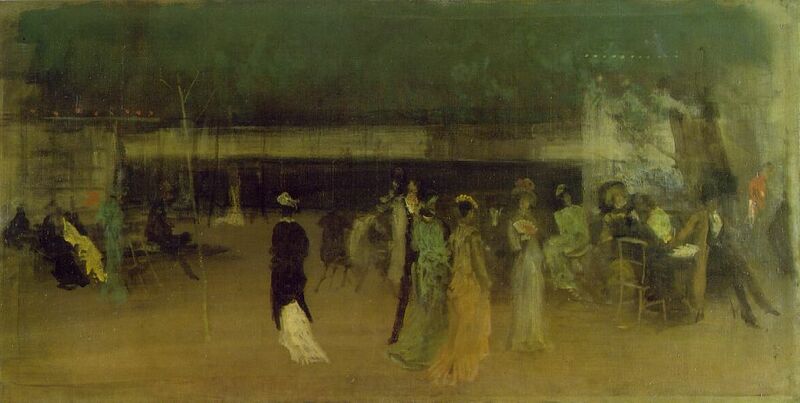 Whistler's paintings are related to Impressionism (although he was more interested in evoking a mood than in accurately depicting the effects of light), to Symbolism, and to Aestheticism, and he played a central role in the modern movement in England. His aesthetic creed was explained in his Ten O'Clock Lecture (1885) and this, and much else on art and society, was republished in The Gentle Art of Making Enemies (1890).